Democratic candidates Shayna Watchinski and Nikita Richards share a moment as results from the county continue to pour in Tuesday, Nov. 6, 2018. Sharon Chung addresses the crowd at Normal's Radisson Hotel after she won McLean County Board District 7, Nov. 6, 2018. She is thought to be the first Asian American elected to McLean County. Shayna Watchinski addresses the crowd at Normal's Radisson Hotel after she won McLean County Board District 8 Nov. 6, 2018. Twelve women were on the ballot in McLean County outside of statewide seats. Three Republicans and four Democrats were elected, including incumbents. “It’s very exciting obviously right now to be a woman running for office, and especially to be a part of this group in McLean County,” said newly elected McLean County Board District 8 member Shayna Watchinski. Elizabeth Johnston ran as a Democrat in McLean County Board District 5. Elizabeth Johnston, elected to McLean County Board District 5. Her race threw the county Democratic Party onto an emotional rollercoaster early Tuesday night after Republican David Selzer was ahead with seemingly all polling places reported. But as the hours went on, numbers in McLean County continued to update on the clerk’s website, and Johnston soon caught up. By the end of the night, Johnston came out on top with 53 percent of the vote. She said the women running in McLean County were quality candidates, but that’s not all it takes to win. Watchinski pointed to the 2016 election as a major spark that inspired women to run for office. As of 11:40 a.m. Wednesday, NPR reported at least 118 women will serve in Congress in the upcoming session. That brings up the total percentage of women from 20 percent to 22 percent. This number may change as election results are finalized. Sharon Chung is the newest board member for McLean County District 7. She is also thought to be the first Asian-American elected to office in McLean County. Nikita Richards lost her race for McLean County Clerk to Republican incumbent Kathy Michael. Nikita Richards was another woman of color on the ballot. She ran against incumbent Kathy Michael for McLean County Clerk but lost in what Democrats saw as a major upset with only 43 percent of votes. Michael is in the middle of an ethics investigation for alleged misuse of county property. Richards was also accused of an ethics violation during the campaign but was cleared of her charges. Democratic Party Chair Erik Rankin said Michael’s win shows the county “still has some issues with people of color.” But Richards said her campaign spoke volumes to the county’s black community. Chung said women candidates are always juggling. Running for public office, children, family, and work all have to find a balance during campaign season, and Chung said the women running in McLean County became master multitaskers. 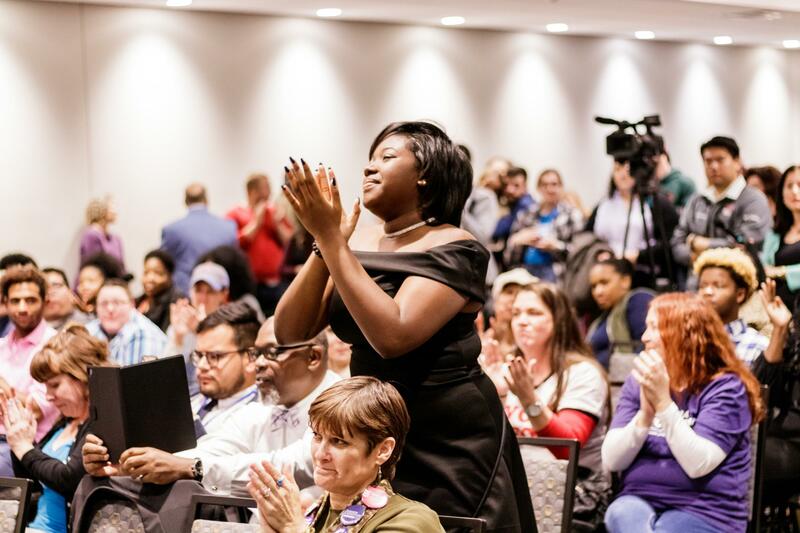 Nikita Richards' daughter applauds as her mother addresses the crowd at Normal's Radisson Hotel on Election Night, Nov. 6, 2018. In her election night speech, Richards mentioned those struggles as a mother running for public office. She talked about how a family close to her took some of the pressure off by watching Richards’ daughter. She also noted the sacrifice children of campaigners make by missing good morning and goodnight hugs and kisses from their parents. 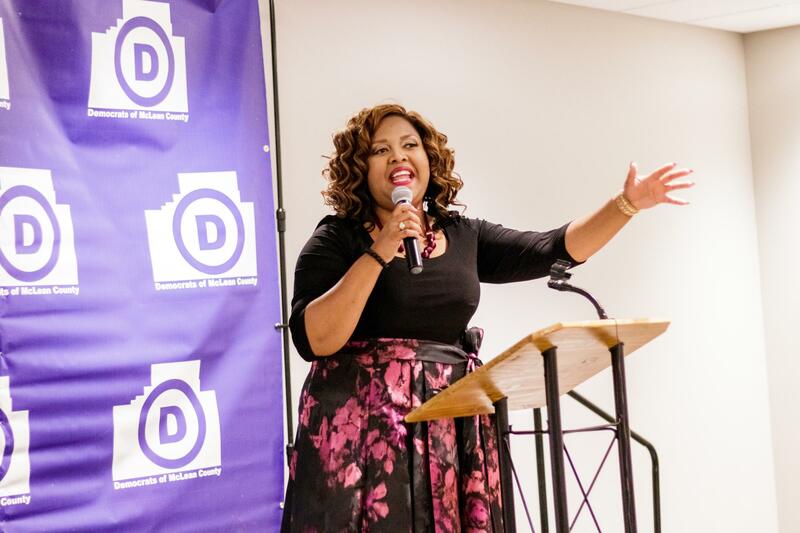 Despite losing her race for county clerk, Richards said she is excited to see what changes her fellow Democratic women elected to County Board will bring. She said the future of the female candidate is bold, fierce, and capable. "No offense to the men on the board, but I think we've got it," Richards said with a wink. 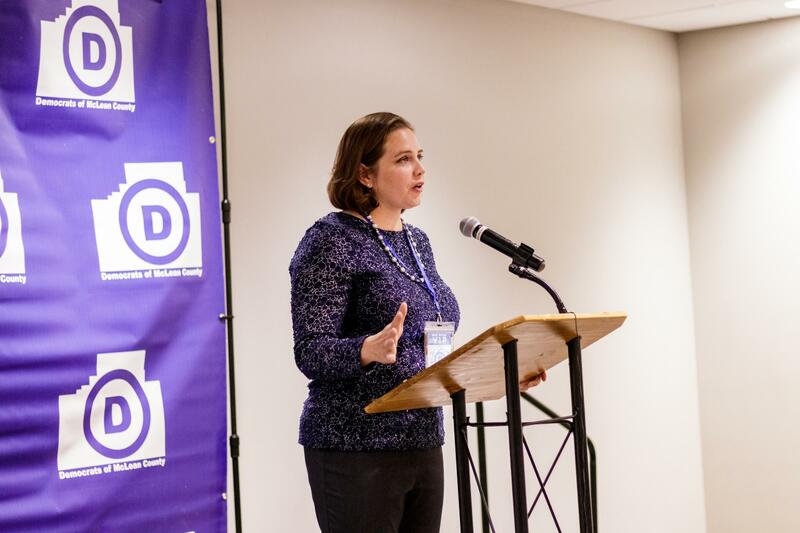 Other female Democratic candidates were Jill Blair for Illinois House District 88, Jen McMillin for Illinois House District 101, and Betsy Dirksen Londrigan for Illinois 13th Congressional District. They all lost. Elected Republican women were Kathy Michael for McLean County clerk, Rebecca McNeil for county treasurer, and Lyndsay Bloomfield for County Board District 9. Cheryl Froelich was the Republican candidate in McLean County District 8. She lost to Watchinski.